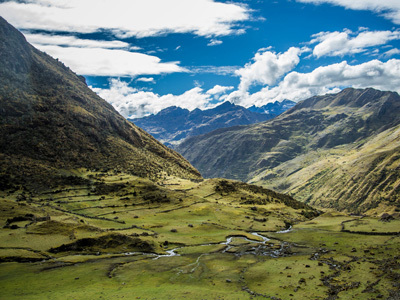 Our Ultimate Lares Trek shared departure offers the ideal blend of mountain scenery, glacial lakes, waterfalls, high plains, and charming Andean villages. With opportunities to bask in the lovely hot-springs at Lares village, or barter for weavings at local markets, each day will offer a new adventure. The final site of the Pumamarca ruins and the picturesque walk along an original Inca trail beside massive and well- preserved Inca terraces, will guide you to the back entrance of Ollantaytambo, which signifies the completion of this voyage. From the Inca Fortress town of Ollantaytambo, you will board the famous Vistadome train for the scenic ride to KM 104 where you will embark on your journey along the Royal Inca Trail to the lost city of the Incas, Machu Picchu! Spend the night in the charming town of Machu Picchu Pueblo, allowing for an early morning experience an entire day exploration of this new wonder of the modern world. Relish in the history of these spectacular ancient ruins, led by an expert guide. Return to Cusco at the end of it all, left dreaming of your recent adventure. This trip can also be offered on a private basis. *Please Note: Check-in is not until 2:00 PM. Early check-in is on request, however it cannot be guaranteed. In the event your room is not ready you will be able to store your luggage at the hotel and explore the surrounding area on your own until check-in time. After you have had some time to settle in you will meet your guide for your introductory tour of Cusco. You will have an expert guide at your disposal to show you some of the highlights of this beautiful city. Tell him what you like and he can advise as to the best route for your tour. You may choose to start with the Plaza de Armas and a visit to its impressive cathedral. Qoricancha temple, once home to life-sized statues in solid gold is another very popular option. This lovely walking (or vehicle) tour is a superb introduction into the Inca heritage of Peru. This morning you will set off to stretch your legs with a delightful hike in the hills above Cusco. 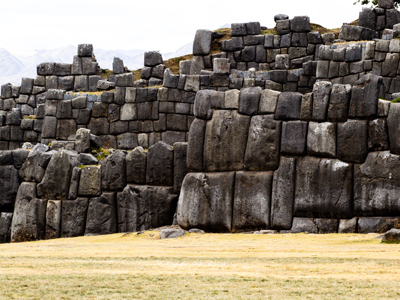 First, you will visit the impressive site of Sacsayhuaman. Huge stone ramparts surround a beautiful grass amphitheater here, a sight not to be missed! Once the scene of fierce battles, it now hosts the annual re-enactment of traditional Inca ceremonies such as Inti Raymi and Warachikuy. On Sundays, you typically see families from Cusco head up here to play, fly kites and dig traditional huatias, a method of cooking potatoes in the ground. Today's adventure takes you to the Sacred Valley. First head towards Chinchero plain before taking a dirt road to the incredible ruins of Moray. These rarely visited circular ruins are thought to have been agricultural experimental stations in the times of the Incas. After visiting the ruins you follow an ancient mule trail with spectacular views of the snow capped Cordillera Vilcanota. You will also see examples of the finest Andean farming on our way. You head back across the plains to the interesting town of Maras for lunch. This is a stunning day of hiking. You leave camp behind and climb past colorfully dressed locals, and up towards the native forests that we have been heavily involved in re-planting. These forests harbor Andean deer, vizcachas and several rare species of birds and are essential to the future of this area. A further push and you reach the stunning views from your highest pass of the trek, the Huchayccasa pass (4450 m/14600 ft). A chain of emerald blue lakes fills the hillside below you, and in the distance rise the snow clad Urubamba mountains. Descending through hand turned potato fields you come to the ancient community of Cuncani at (3800m/12,4600 ft). Another great day awaits you. After a hearty breakfast, you begin to climb gently towards your final pass. This is a day filled with encounters with locals. Strong-legged men head off to work in the potato fields, wooden plows slung over their shoulder. Rough-handed women sit, legs outstretched weaving their traditional clothes on wooden looms. And small children sit motionless guarding herds of alpaca and llama, their ever faithful dog by their side. *Please Note: Times noted above are provided as an example. Exact details will be provided upon booking. Early this morning you'll leave the hotel and walk to Ollantaytambo Train station to catch the train to Machu Picchu. Jumping off at KM104 you pass through the control point and begin your Royal Inca Trail trek. First, you visit the recently restored ruins of Chachabamba before gradually ascending through tropical cloud forest up towards the base of Wiñay Wayna. Here you climb more steeply on old Inca stairways through these beautiful terraces, stopping to explore the various buildings and water features. Here we can enjoy our packed lunch, with a great view. You then continue on perhaps the loveliest part of the whole Inca Trail. Lush vegetation flanks you on either side, the scent of wild orchids fills the air, and all around you brightly colored tropical songbirds fill your ears with song. Soon you will reach a final set of stairs to arrive at Inti Punku, the gateway of the Sun. 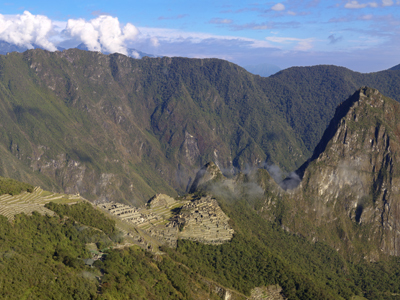 As you step through the old stone gateway, Machu Picchu appears laid out before your eyes. After plenty of photos, you carry on past this wonder of the world to catch the bus down to the lively town of Machu Picchu Pueblo and a well-deserved hotel and shower. Today you explore the pinnacle of Inca engineering - Machu Picchu. For years it was lost to the jungle. Rediscovered in 1911 by the Yale professor Hiram Bingham, declared a UNESCO World Heritage Site in 1983 and one of the New Seven Wonders of the World in 2007, Machu Picchu exceeds all expectations. This astounding site lies in an even more astonishing location. Perched high on an inaccessible hilltop it is protected by huge cliffs and the raging Urubamba river. Things are slightly easier now than in the time of the Incas and so you start your day with a twenty-minute bus ride up to the site. Upon arrival in Ollantaytambo train station at 5:30 PM you'll be transferred to your hotel in Cusco. Enjoy the evening to rest and relax at your leisure! If what you're looking for is a conveniently located hotel in Cuzco (Cusco), look no further than Quinta San Blas by Ananay Hotels. From here, guests can enjoy easy access to all that the lively city has to offer. With its convenient location, the hotel offers easy access to the city's must-see destinations. The facilities and services provided by Quinta San Blas by Ananay Hotels ensure a pleasant stay for guests. For the comfort and convenience of guests, the hotel offers free Wi-Fi in all rooms, 24-hour front desk, luggage storage, Wi-Fi in public areas, room service. In addition, all guestrooms feature a variety of comforts. Many rooms even provide wake-up service, heating, desk, soundproofing, telephone to please the most discerning guest. The hotel offers many unique recreational opportunities such as outdoor pool, massage. 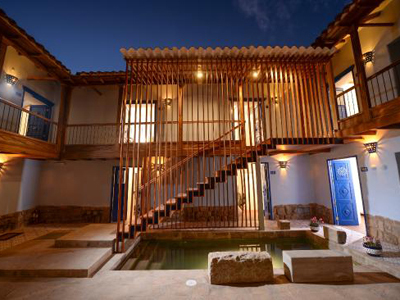 Superb facilities and an excellent location make the Quinta San Blas by Ananay Hotels the perfect base from which to enjoy your stay in Cuzco (Cusco). Located in the heart of the Sacred Valley of Cusco, boutique hotel Lizzy Wasi is a haven that boasts a refined yet cozy ambience. A refurbished century- old adobe cottage, it offers a unique environment surrounded by breathtaking landscapes, ideal for relaxation and refueling. Lizzy Wasi is run by its owner, Liz, an American who came to Peru and fell in love with the country and its people. She will make sure that you receive comfortable accommodations and detailed personal attention that will make your trip an unparalleled journey of adventure and pleasure. Each guest room, authentically decorated, counts with details such as goose down blankets, security safes, and hair dryers. 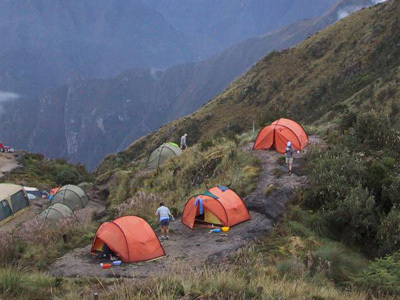 Camping on the Lares Trail is an experience like no other. Meet and become friends with the porters and cooks that will support your journey as you weave your way through the Peruvian Andes. While walking all you need to carry is a daypack. Your luggage is carried by the porters, your tents are put up for you and your food is prepared for you. All you have to do is shoulder your daypack and enjoy the walking. Tents are new and sturdy and can fit up to two people each. Nothing beats waking to the smell of breakfast and stepping out of your tent to spectacular panoramic views of the mountains.